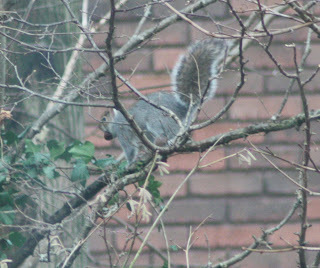 In my back garden there is a grey squirrel that lives in one of the trees. As you can see in the picture he is quite a big squirrel. He or she is called Sam. I called him Sam because it doesn't matter if it is a boy or a girl because Sam can be for either. We have seen him in the garden before but this is the first time we have got a photograph. Today my sister saw him first when we were having lunch and then mum saw him and then I saw him. He was jumping from tree to tree. he was there for about five minutes and then our cat came and started stalking him so he ran away. We are going to give Sam a Christmas present of some nuts. We have another creature in our back garden called Francis the fox. But sadly we can't give Francis a present because I'm too scared! I hope we see Sam on Christmas Day. Wouldn't it be great to have everyone sitting at the table in the conservatory eating dinner and Sam appear in his tree? Maybe Dog the Bounty hunter could capture both Sam and Francis for a Christmas picture.